We're reprinting a popular article that describes a great analogy for writing and editing: the Japanese craft of Hikaru Dorodango. Enjoy!! I recently became aware of the Japanese art of Hikaru Dorodango. 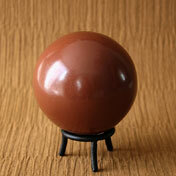 Translated as “shining ball of mud,” Hikaru Dorodango is a centuries-old craft done by Japanese children. A handful of mud or clay is formed and pressed into a sphere. As moisture condenses and is removed over time, the ball goes through several sessions of smoothing and polishing, finally culminating in a shiny, polished sphere. One of the keys of Hikaru Dorodango is the patience of the crafter to allow as much time as is needed to complete several rounds of smoothing, drying, rubbing, and polishing to reach a pearl-like luster. The quality of the finished product depends entirely upon the commitment of the maker to allow the clay to reach its full potential. The patient crafter is rewarded with a true work of art. The impatient crafter has a round ball of mud that looks like … a fairly round ball of mud. I was immediately struck how the craft of Hikaru Dorodango resembles the process of a writer crafting their words from a manuscript into a published book. To create a pearl of beauty requires a commitment of time and patience to see it through to be the best it can be. Will your published book glow as beautifully as it can? Business book writers and thought leaders get it. Serious authors understand this, too. Just like there is no rushing an oyster’s pearl or a dorodango ball, there should be no rushing your book. I imagine there are several times when a crafter of Hikaru Dorodango—especially a younger person with a shorter patience threshold—wants to say, “this is good enough.” They hold a rough ball of mud in their hand. Compared to a finished, pearl-like sphere, the shortcomings are obvious. It looks pretty good. It’s fairly round. There’s a kind of smoothness to it. It sits quietly as if holding the promise of what it could become, if given the time and care to complete its evolution. A book can be like the child’s dorodango. The outer shine can be accomplished with time and care … or by artificial means. A striking cover illustration or photograph can sure help any book look like a great product. A dynamic title, presented with the right font and colors, can sure give a professional first impression. But it’s the inside of the book—its editorial integrity—that determines the overall quality of the product. It’s the development of the storytelling; the effectiveness of the information’s presentation; the journey that the reader takes, that determines their overall satisfaction with the book. Imagine your book—and the books you will compete against—as a Hikaru Dorodango. You can bet that the traditional publishers who bring out your best competition will spare little time or expense allowing each of their books to be developed, shaped, and polished to create the most professional end product they’re capable of publishing. Beware of those pay-to-publish companies that will do everything they can to get their authors to spend as much as possible, while their overall goal is to spray on the best shine they can manage while creating the greatest profit margin possible. They’ll push the most expensive cover design their authors can afford. They’ll probably push for every marketing option their authors will spring for, too. The result might pass for something with a shiny shell. When you work with Redbrush, we will encourage you to go slow. We want you to allow your project all the time and attention that it needs to create exactly the end results that you desire. If your goal is to put out a product that will rival anything a traditional publisher could produce, Redbrush can help you do exactly that. If you want to create something that will look good enough for your friends and loved ones, Redbrush can point you in the right direction. You will decide whether your book will be a published work of art or a lackluster ball. More than ever before, the choice is really up to you. Let Redbrush help you create something wonderful! In the New Year ahead, have the patience to create something amazing! Then, let it shine!